It is almost impossible to find someone that does not enjoy relaxing in a hammock. Hammocks are probably the best way to relax under the shade during a hot summer day. The fact that are so easy to install and take almost no storage space makes them ideal for the ones that enjoy spending time out in the great wilderness or at home, under a tree in the backyard. On top of all that, they are not that expensive either. Hammocks have always been affordable and there is no reason to pay a premium for one. 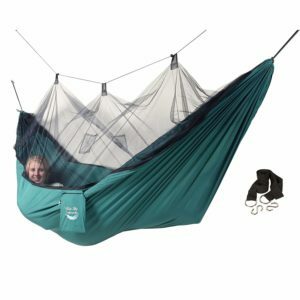 Maybe it might be worth if they have some weird gimmicky feature but a standard hammock should never be expensive. Speaking of features, today we will not be looking at standard hammocks. For our list, we selected only hammocks that have a mosquito protective net. These things will prove to be extremely handy especially for people that spend time hiking or out in nature. There is no effective way to protect yourself against mosquitos except for a mosquito net and it makes sense to have a hammock that has one. Usually, they are just the same as a regular hammock but have a special mosquito net made out of a mesh material which sits up lifted in order not to make it uncomfortable for the person in the hammock. The design is fairly simple and the vast majority of hammocks with mosquito nets are quite similar. We still picked 10 hammocks for our list that are durable and inexpensive. Here is our list of the top 10 best hammocks with mosquito net in 2019. 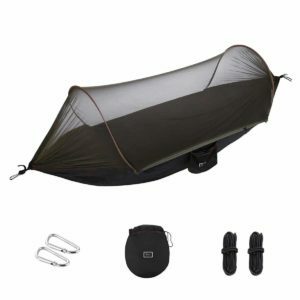 FiveJoy Pop UP mosquito camping hammock is a great pick for the ones that need something easy to pack. It takes very little space in a backpack and it is quite easy to setup. The model is made using a breathable material, the same one as the fabric used for parachutes and has double stitching to ensure durability. It can support a maximum load of up to 400 pounds. 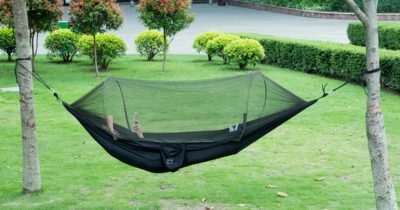 As for protection against mosquitos, the hammock uses a simple net that is very easy to remove and does not obstruct visibility. The netting used for the hammock is not the most resilient one. It can get torn if it is not handled properly. Even if it tears, it can be patched but it is not something that should be happening. The net should have been made from a more durable material. iSPECLE camping hammock is not only inexpensive but practical as well. The hammock uses durable parachute nylon and was made to be very reliable. It can support up to 440 pounds and has a length of 9.5 feet. 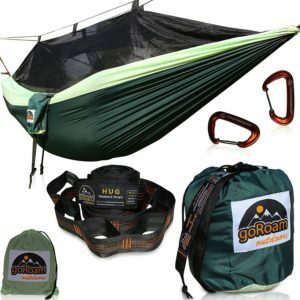 The hammock is also very easy to pack and comes with a carry bag and all the required accessories. As for size, the hammock is well suited for 2 people as long as the maximum supported capacity is not exceeded. The wires used for the hammock are quite rigid and if it is not properly setup, they can break through the plastic. It can tear the hammock and make it almost unusable. If it is handled properly, the hammock should last for several years. 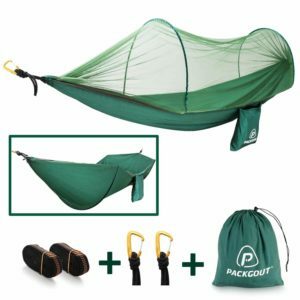 Packgout mosquito hammock is one of the more affordable models on our list but it is also a bit smaller. It is a one-person hammock made using a durable material that takes very little storage space when folded. The mosquito net is held in place using an aluminum frame while the straps are made using high durability nylon. Even if it is a bit smaller it can support the weight of two people. It is also durable enough and will not get torn even by pets. 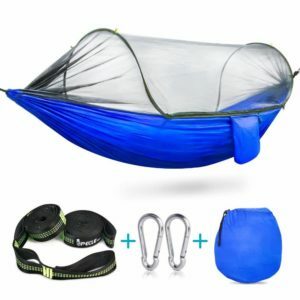 The full bundle includes the hammock, mosquito netting, carabiner clips, straps and a storage bag. A person that is a bit taller will have issues with the hammock. Even sitting in a diagonal in the hammock will not cut it. It is not long enough. Some might go as far as claiming that the hammock is made for children due to its shorter length despite being capable of holding 2 adults. GoRoam outdoors hammock is one of the largest models on our list. It has a reliable construction using very durable nylon and lightweight carabiners. The hammock comes with a mosquito net that uses a secondary wiring to keep it suspended above the hammock. To make it easy to travel with the hammock comes with its own travel bag. The lengths of the model make it suitable for one adult while the nylon used can support a maximum weight of 500 pounds. The fabric is quite durable when pulled. It supports a lot of weight but it is not that resilient when it comes to sharp objects. It tears easily. If the hammock gets torn, stitching it is not an option as it will get ripped back quite easily. G4Free portable camping hammock offers great value for the money. It is inexpensive but still decent and functional. The hammock comes with a dedicated mosquito net that uses aluminum frames to keep the net lift. Weight capacity is limited to a maximum of 440 pounds and has a length of 118 inches. The straps it uses are made of nylon and it is very easy to setup. When folded it does not take that much space which is why it is recommended to the ones that enjoy camping and hiking. The mosquito net can get damaged quite easily. Sharp objects will cut through it quite easily. Tree branches will also perforate it without much effort which is why it is important to pay a bit of attention to avoid damaging it and rendering it unusable. 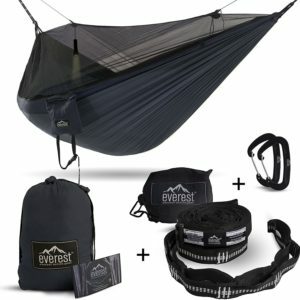 The everest active gear double hammock can be considered a premium model. Having a durable build quality with heavy duty parachute nylon fabric allows it to withstand a maximum load of 400 pounds. It uses a very fine mesh for the mosquito net that has small wires which get attached the same way as the hammock. The setup is very simple and takes only a few minutes. As for dimensions, the hammock is 10 feet long and 6 feet wide. It includes a small carry back and several additional accessories. At first glance, the hammock has a reasonable price but there is a problem. Unlike other models in our list, it does not come with the required straps. They will need to be purchased separately. This bumps up the price of the hammock a bit which is why it can be considered a bit too expensive. 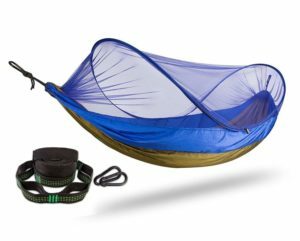 Blue Sky outdoor mosquito traveler hammock is a great pick for the ones that are on a tight budget. It is a cheap hammock with a decent construction. It includes tree straps and can support a maximum load of 330 pounds. The model includes a small carry pouch and all the required accessories. For the mosquito net, the manufacturers used 2,100 holes per square inch fabric that provides decent protection. The net needs to be tied using straps just like the hammock. The netting used for the hammock is not very resilient. It does offer good protection but its durability is not the greatest. It can get ripped easily with sharp objects. Also, pulling it a bit harder will also cause it to get ripped. On the other hand, for the price it offers a very good deal. TinyBigAdventure Eclypse II camping hammock is a great pick for the ones that like to spend time out in nature. It was designed to be easy to carry and take very little storage space. The model is made using a very durable nylon that is also used for parachutes. For protection against mosquitos, the hammock uses a durable net and has triple stitching that makes it very durable. The hammock can support 400 pounds and can sustain 2 people as long as the load is not exceeded. Even if the hammock is strong enough to hold more than one person, it is just a bit too narrow. Two people will not be able to fit comfortably in it. This means that it is quite difficult to exceed the weight limit. 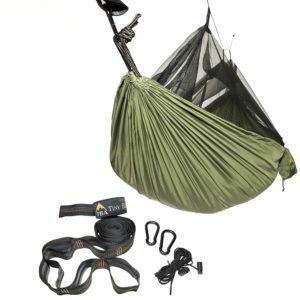 isYoung hammock is one of the cheapest models that money can buy and surprisingly it does not have any notable disappointing aspects. It has generous dimensions and supports about 440 pounds in terms of the weight limit. The hammock is made out of a durable nylon fabric that is also used for parachutes and comes with a mosquito net cover that is held up by two arched frames. For the money, users will also get the needed straps and a small carry bag. 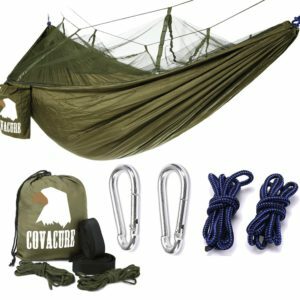 Covacure camping hammock offers great value for the money. 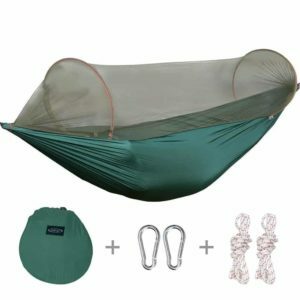 This inexpensive hammock comes with a bundle that includes the straps, attachment hooks, and a small carry bag. Like most other hammocks on our list, the model is made from the same nylon material from which parachutes are made. This makes it very resilient to tears and can withstand a maximum weight of up to 400 pounds. The mosquito net is zippered on and held suspended by additional straps that are included with the hammock. The hammock is somewhere in the middle when it comes to size. It is not big but not small either. Two people will not be able to fit in it. Also, tall people will find it a bit small. An average individual will be able to fit comfortably in the hammock. Hammocks may come in different shapes and sizes. There is a great deal of different models to choose from and at first glance they tend to looks the same. Truth be told, the vast majority of them are made out of the same nylon fabric from which parachutes are made because it is very durable. The difference comes from other aspects that may determine if a hammock is suitable or not. Here are some things to look out for when shortlisting a few hammocks with a mosquito net. Size: Size is probably the most important thing to look at. Some of them are quite small and might not be suitable for an adult. Others may be large enough to hold 2 adults comfortably. Maximum weight supported: The maximum weight supported is not necessarily determined by the fabric from which the hammock is made. The straps used can play an important role which is why hammocks made from the same fabric may support different maximum loads. What is included in the hammock: Usually, hammocks come with everything needed but some may not have the straps and will need to be purchased separately. This needs to be taken into account when looking for a hammock in order to avoid getting one that cannot be used.